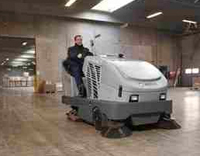 MRC Property Services has embraced the opportunity to offer the Nilfisk Ride-on Sweeper Scrubber cleaning service. This versatile machine is a highly technical and advanced cleaning machine. Providing dust and cleaning services specifically for industrial and commercial applications such as car parks (including multi-storey and A grade), shopping centres, factory floors, warehouses, airports, stadiums, exhibition centres, manufacturing plants, construction and building sites etc. If you require your commercial floor to be cleaned, MRC Property Services can provide this professional cleaning service for you, in order to meet Occupational Health & Safety standards. 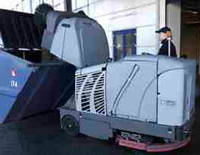 Providing a combined cleaning, sweeping motion, the machine offers a huge 900mm main broom, with a 1600mm wide sweeping path, providing dust control by spraying a mixture of water and cleaning aids and sweeping the required area. The ride-on sweeper scrubber offers excellent manoeuvrability due to power steering so is easy to operate and effectively clean all smooth, uneven and incline floors. MRC Property Services can meet your daily or weekly requirements and cleaning needs, working ‘after hours’ or any time throughout the day to fit in with your work schedule. MRC Property Services will work with you to prepare a customised maintenance schedule to suit your individual business needs.